The EU-sponsored network ERA-NET PathoGenoMics seeks new leads for future treatment and diagnostics of infectious diseases by supporting research on disease-causing microorganisms in Europe, accentuating analysis of critical factors on a genetic level. In line with this goal, the network awards prizes for outstanding PhD theses in pathogenomics. 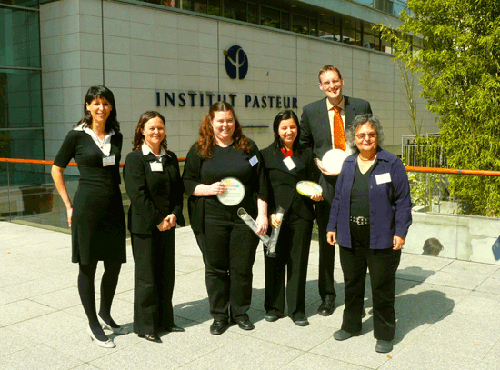 This year, during the “Genomes 2008” conference, (Paris, April 8-11) the network recognised three nominees from France, Portugal and Germany. The ERA-NET PathoGenoMics, initiated in 2004, is a network of 15 funding organizations from Austria, Finland, France, Germany, Hungary, Israel, Latvia, Portugal, Slovenia and Spain which promotes European genomic research on pathogenic microorganisms (pathogenomics). It is one of about 70 ERA-NET networks aimed at both overcoming fragmentation of the research in Europe and fostering cooperation in research activities carried out at a national or regional level in the member states. The ERA-NET scheme is a funding instrument of the European Commission, first introduced in the Sixth Framework Program. Now, for the third time, ERA-NET PathoGenoMics has recognized three outstanding PhD theses in pathogenomics research and awarded each one of the winners a prize of 2000 Euros. This year's winning researchers, Marie Bouvier, (France), Cristina Dias Rodrigues (Portugal) and Sascha Thewes (Germany) were chosen by a review board of internationally renowned experts in the field of microbial research. Marie Bouvier, carried out her thesis at the Pierre & Marie Curie University in Paris, France, focusing on the analysis of single strand recombination in integrons. Integrons are small genetic sequences in bacteria that can capture other DNA fragments from chromosomes or plasmids and thus may play a role in bacterial horizontal gene transfer. Marie Bouvier is now working at the Max Planck Institute for Infection Biology in Berlin. Cristina Dias Rodrigues from the University of Lisbon in Portugal, studied liver infections caused by Plasmodium parasites at the University of Lisbon, Portugal. In the course of her research, she discovered important, host-related factors that influence the development of the infection process. Cristina Dias Rodrigues is now working at the Institute of Molecular Medicine in Lisbon. Sascha Thewes, working at the Robert Koch Institute in Germany, analyzed, on a molecular level, the ability of the usually harmless yeast Candida albicans to enter the bloodstream, invade and penetrate all organs of the body, resulting in life-threatening systemic infection. Sascha Thewes is now working at the Free University of Berlin.